Manfred Kusch’s garden is loud, in an idyllic sort of way. Birds tweet and flit, bees buzz, and the air hums with the wings of one of America’s most beloved creatures: the hummingbird. California fuchsia is a magnet for hummingbirds. We asked UC Davis Arboretum director of public horticulture Ellen Zagory for the best, drought-tolerant plants that attract hummingbirds. Look for these plants on her list at the Arboretum Plant Sale on Saturday, April 25. Tubular red-orange flowers hold lots of nectar in summer and fall. Varieties range from silvery 3-foot tall ones to dwarf, dark-green foliage ones. Its flowers are a magnet for hummingbirds. The plant spread underground and is best kept in full sun with only a few summer irrigations. Long stalks of coral pink flowers arch out from this fibrous-leaved, spiky plant in spring and summer. With attractive curling hairs on the leaf edges, it’s good as an accent plant and is tough enough to take lots of sun and little water. This is a native shrub found in the Vaca Mountains by Davis. It blooms in winter and very early spring with dangling clusters of pink flowers that provide an important food source for our local Anna's hummingbird that overwinters here. It performs best when shaded from hot afternoon summer sun. Red and orange flowered aloe species like Aloe X spinosissima and Aloe striata and aloe hybrids provide a banquet of nectar for hummingbirds in March and April. Plant in front of a window, and you will be sure to see hummingbirds hovering and feeding on its nectar, then resting on the flower stems. It requires sun or part shade and low water. This small shrubby plant comes in a number of red-flowered cultivars that are attractive to hummingbirds. Flame, Scott's Red, Furman's Red and other varieties are great for their long season of bloom both in spring and again in fall. Pruning them to keep them bushy will help increase its show of flowers. Other red-flowered sages are also excellent. While the program’s volunteers, staff and faculty come to trap, band and release hummingbirds — sometimes 50 in a morning — the hummingbirds come for the flowers. Salvia, California fuschia, bladderpod, aloe and others important to hummingbird health dot the garden in bright bursts of color. Most of these flowering plants were bought over the past 30 years from UC Davis Arboretum plant sales and planted specifically to attract pollinators like bees and hummingbirds. “I probably transplanted about half of the arboretum here,” joked Kusch, whose property abutting Putah Creek in Winters was mostly dirt and weeds when he arrived. 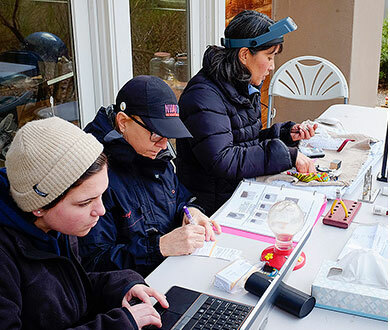 At a table overlooking the garden, Tell, a federally permitted master bander, and student volunteers Emilie Graves, Shannon Skalos and Nicole Mikoni delicately give a health checkup for each hummingbird that they catch in a specialized trap. After softly wrapping the bird in a small mesh bag, they assess the age of the hummingbird, count the iridescent feathers on its throat, measure its bill and wing length, and check for feather molt and tail mites. Then, with the steady hands of a surgeon, Tell attaches an aluminum band the size of a basmati rice grain around the leg of any new captures. Checkup complete, they feed and then place the hummingbird in the palm of their hand, where it vibrates softly until the bird realizes it is free and—in a blink—launches off into the trees. While bees get most of the pollinator glory, hummingbirds are also important pollinators. 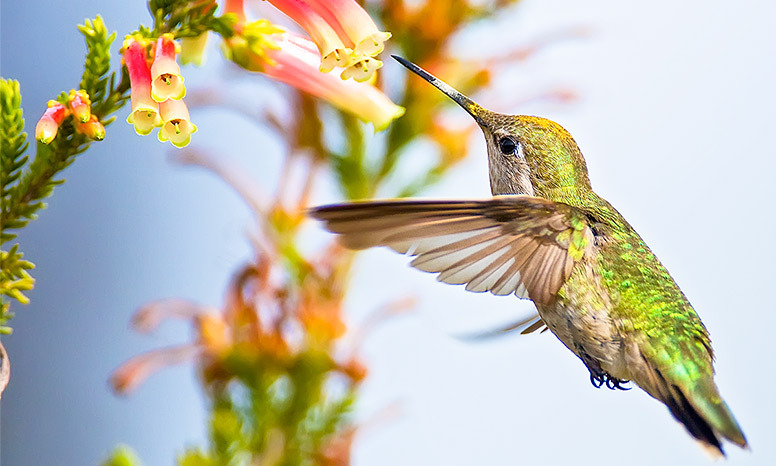 More than 160 native North American plants depend exclusively on hummingbirds for pollination. A sentinel species, hummingbirds can indicate overall environmental health. They are threatened by habitat loss, climate change and human development. Yet, amid these threats and despite their importance, little is known about their health and genetics. For instance, when colony collapse disorder threatened the existence of bees, it was important to know what was normal for bee health so that scientists could recognize when something was wrong. Professor Emeritus Holly Ernest founded the Hummingbird Health and Conservation Program while she was a wildlife geneticist at UC Davis. Ernest now continues hummingbird genetic work as a professor at the University of Wyoming, where she moved last year. 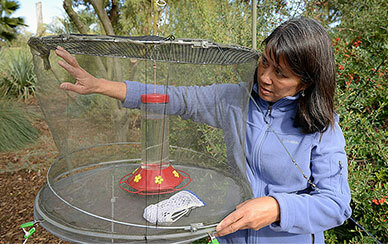 She and the new UC Davis director, Tell, work closely together to investigate hummingbird health. The program discovered and diagnosed a viral disease, avian pox, in Anna’s hummingbirds. It’s currently researching the prevalence of blood parasites in California’s hummingbirds and how climate change can impact hummingbirds’ susceptibility to malaria and West Nile virus. A newly launched study is examining hummingbird exposure to heavy metals and pesticides. The program is also investigating the prevalence of tail mites in the birds. “Before people see large numbers of declines in hummingbird populations, we want to figure out what we can do from a prevention aspect,” Tell said. Kusch vividly remembers the first time he saw a hummingbird. When he was a 6-year-old boy in post-war Germany, a man arrived at his one-room schoolhouse and, in exchange for food, showed his class some magic tricks. For one of his presentations, the man opened a little box. Inside it was a tiny preserved bird, a hummingbird. “I thought maybe he was tricking us — a bird this small,” Kusch said. Years later, as a doctoral student at UC Berkeley, he saw a live hummingbird in a tree, and soon learned the tiny birds were native only to the Americas, and that California was full of them. 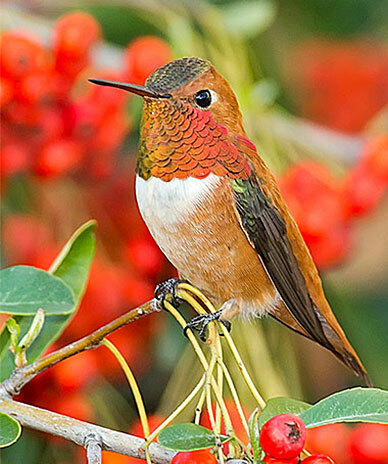 The smallest birds in the world, hummingbirds weigh as little as 2.5 grams, the weight of a penny. They can fly forward, backward and hover. They can travel 600 miles at 25 miles per hour, some journeying 3,000 miles a year. They’re fast little guys, capable of flying in bursts up to 60 miles per hour while their wings beat 80 times per second. To get people to pay attention to protecting the world around them, it helps to have an enchanting creature on hand.